Carla Cordova-Eduave, PA-C joins SpineNevada with experience working as a Physician Assistant (PA-C) in the Reno / Sparks / Carson City area. She is a native of Reno-Tahoe and graduated from Robert McQueen high school. 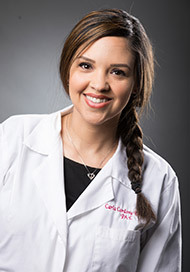 Carla attended the University of Nevada Reno and Truckee Meadows Community College before her love of medicine lead her to the state of Washington. She earned her Bachelor’s Degree in clinical health studies at the University of Washington. Carla was next accepted into the MEDEX northwest Physician assistant program through the University of Washington School of Medicine and served as class vice president. Since 2010, she has been certified by the National Commission on Certification of Physician Assistants. Carla’s love for Northern Nevada propelled her to return and serve the community that was so good to her. Carla takes a compassionate approach to treating her patients using non-surgical treatment options. She knows the importance of treating the entire patient and understands pain caused by spine and musculoskeletal conditions also affects emotional and mental health. Over many years working as a PA-C, she has learned multiple procedures to help improve the quality of life for her patients suffering with acute and chronic pain. Carla has additional experience in Cardiology, Pulmonology, Infectious Disease, Internal Medicine, Women’s Health, General Surgery. Click here to learn more about PA-C's.